It seems the nostalgia boom of Pro Set collecting has all but come to an end. Sure there are several of us out there still flipping over cards in junk lots and scouring auction sites for new and interesting oddities but nothing quite like the heyday of the late 00s, early 10s. In those years, there seemed to be so much being uncovered, an endless supply of new items to chase and an ever-growing population of collectors jumping into what are arguably the most error/variation laden products of the junk wax era. Over the last five+ years, the collector slowdown started gradually (and I blame much of this on the glut of printer’s scrap and sheet cut items hitting the market) and has pretty much come to a near stop, save the likely, few dozen collectors still pursuing the impossible idea of a “complete” set. Let’s take a look at some of the cards which have filtered out to remain truly rare and elusive, and, conversely, which previously-believed to be rare items have proven to be much more acquirable. Below is my completely unscientific and very fallible list of Pro Set winners and losers, after watching a recording appearances for sale, realized sales and frequency of availability for purchase. Obviously this does not take into account collector to collector data. Steve Young #666 – I believe this to be toughest Pro Set issue of all. Despite information, including pics, circulating for over a decade now, I do not recall a public sale of this card. Truly the holy grail of Pro Set issues, across all sets and sports. Eric Dickerson #338 – FACT Cincinnati. Have any copies of this card changed hands or been offered for sale in the last seven-to-ten years? As far as I know, none have. I had received an email ca. 2010, I think, that contained an image of the card back. I do not believe I had seen it prior to or since then. 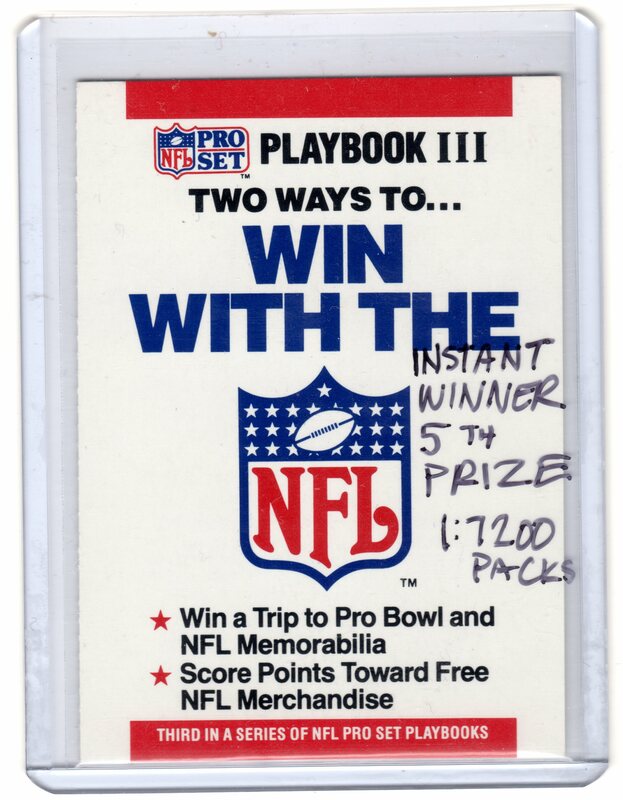 Truly a worthwhile runner-up to the Steve Young card as most sought-after and elusive 1990 Pro Set issue. Paul Gruber #310 – Missing name, position and uni number on back. Unreal to me that only one copy has surfaced. This card is similar to the 1990 Topps Frank Thomas NNOF, where, clearly, an obstruction blocked an imperfect portion of black ink on back. Though unconfirmed, I believe that whichever Bucs player sat above his card on the 10-up sheet strips should also be missing black ink on their cards. Dexter Manley #772 – missing bio or “ghost bio” variation. Via emails and ebay messages ca. 2005, I was turned on to this card’s existence but did not see a copy until 2010. Since then, I know of just four copies in existence. Two of which are never likely to leave their collections. 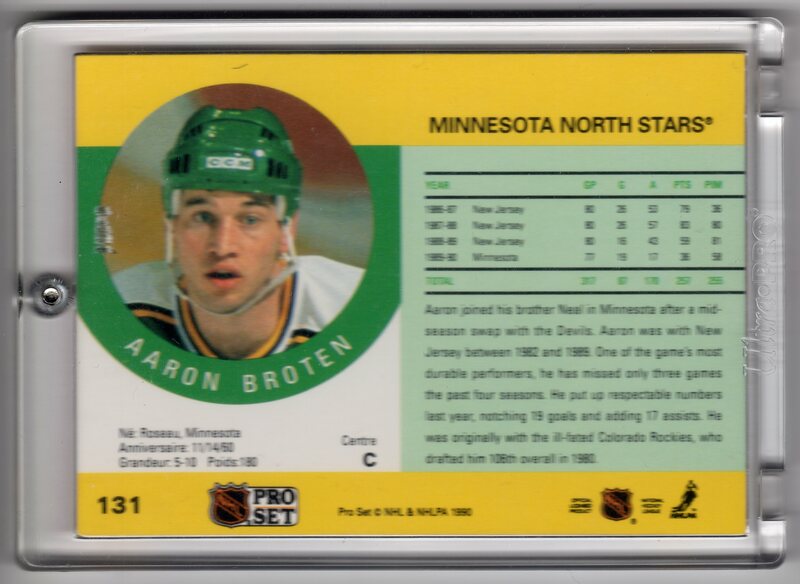 Odds are, like all other rarities in mass produced sets, there are more out there but this variation remains one of the most elusive Pro Set mistakes produced, even if categorized as a “print flaw” by most. Chris Hinton PB #343 – Trade snipe on front, “Has been named…” text on back. This odd transitional version appeared for sale with some regularity for a small stretch a few years ago but they have pretty much become a ghost these days. Chris Hinton PB 343 – Trade snipe on front, “Six-time…” text on back with white text in snipe on front. This card was allegedly updated/reworked at the same time Rison’s card #134 was, which coincidentally also can be found with white text in the snipe on front. Made more interesting by the fact that the two players happened to be swapped for one another as part of the Jeff George draft day trade! Both cards went through several changes across the life of the product and these versions pop up very, very occasionally. I do not have a proper count but I will guess no more than ten copies of each have show up for sale. 800 copies of 1990 Upper Deck Mike Witt #702 Discovered! A card previously believed to be quite rare, with under 50 copies estimated in circulation has now jumped to closer to 1000 known copies with the recent discovery of an 800 count box filled with 1990 Upper Deck card 702, featuring Mike Witt. The cards were believed to have been pulled from production and destroyed, however, it appears that at least one box made their way out of the factory. I have a guy looking for my help. I have been assisting him. He opened a factory set and instead of the high numbered set being included there were 100 Mike Witt Black Box’s inside. He found in California, and my thought is that it is a employee box that was filled with them. Have either of you guys found any counterfiets of these ? More importantly, how can you tell counterfiet UD like the griffey to help him out…..
Olbermann told me he had 12 and would buy any more from me……. and I knew of another 15 out there…..so I know there were appx 30 out there I know of…..
scratch that….the Whole 800 were all mike witt black box!!!!!!!!!!!!!!!!! A very interesting situation which is certain to bring down the value of the Witt tremendously. 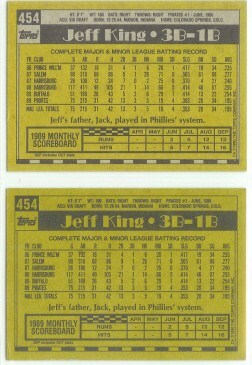 While the card is still a great oddball piece of collecting history, the value on them has steadily decreased over the years with the last 10-20 copies discovered being offered for sale. 800 new copies entering the market will certainly see a major drop off after 50 or so have sold. Another question that comes of this is: how many of these boxes of Witts are out there? With UD’s reputation for manufactured errors, extra “executive” print runs of hot cards and back door removal of hot cards in their early years, I would guess that this will not be the only find.